Additionally, we are open on the last Sunday of each month by appointment only. What makes Laurent such a unique stylist not only in New York City, but perhaps the world over, is his unusual understanding of the way a man’s hair and face mature as he ages. There is a reason for this, which you quickly understand when you spend time in his salon. The men in his chair are long-time clients. 20 years. 30 years. Many go back 40 years, when Laurent first moved from Paris and began cutting hair in New York City. These clients, who include entertainment and finance execs, figures in the film, theater and dance world, began coming to Laurent as young men. He has cut and styled their hair as they’ve matured and advanced through their careers. Along the way, Laurent has evolved their look with them as their facial structure has matured, along with their hair’s texture, color and, yes, the amount of it. Come and meet Laurent and see for yourself. Everyone is a friend. That is Laurent’s way. Laurent’s approach is anti-hype. His salon is warm and relaxed, like a living room. And like the salons of Paris, it brings together men who would not ordinarily meet. And, over the years, everyone has gotten to know everyone. When you meet Laurent DeLouya, you will see why. A (very) brief history. 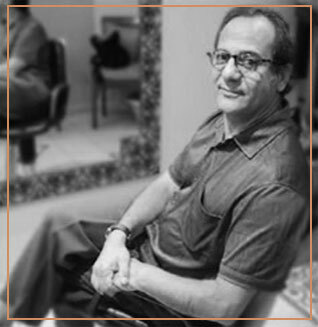 Born in Casablanca and raised in Paris, Laurent trained in the celebrated salon of Jean Hugo. He moved to New York and opened La Boite a Coupe in 1977.